WELCOME! This interdisciplinary program offers an intensive exploration of the literature, history, religion, languages, and art of the Middle Ages and Renaissance. The capacity of language both to communicate truth and to manipulate perceptions of it was as vexed a problem for the Middle Ages and Renaissance as it is today. From Augustine to Erasmus, enthusiasm for the study of rhetoric was accompanied by profound concern about its capacity to mask the difference between authenticity and deceit, revelation and heresy, truth and truthiness. Even the claim of authenticity or transparency could become, some thinkers argued, a deliberate form of manipulation or “spin.” In our current era when public figures aim to create effects of immediacy and authenticity, this conference looks at the history of debates about rhetoric and, more generally, about the presentation of transparency and truthfulness. Taking an interdisciplinary approach, this conference considers the role of the verbal arts in the history of literature, law, politics, theology, and historiography, but also broadens the scope of rhetoric to include such topics as the rhetoric of the visual arts and the language of the new science to produce effects of objective access to “things themselves.” Plenary speakers will be Lorna Hutson (University of Oxford) and Dyan Elliott (Northwestern University). Thank you for your interest. Online registration has now closed. Walk-in registration is available at the event in the lobby of Barnard Hall, with cash or check accepted. Karen Sullivan, Bard College: Medieval Sincerity and the ‘Reality Effect’: Did Troubadours Love Their Ladies? Lauren Mancia, Brooklyn College: Credo: Did Medieval Monks Really Believe? Thank you for your interest. Online registration has now closed. Walk-in registration is available at the event, with cash or check accepted. Please join us for a year-long speaker series designed especially for undergraduates in the Medieval and Renaissance Studies programs at Barnard and Columbia. As part of this series, alumni of the university will discuss in an informal setting their academic and professional trajectories, as well as their current work. Refreshments will be served. Thank you! 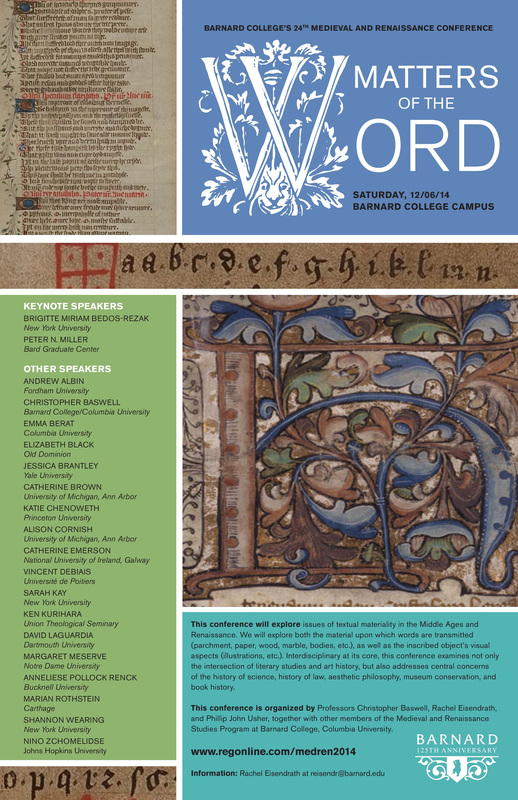 Matters of the Word will explore issues of textual materiality in the Middle Ages and Renaissance. We will consider both the material upon which words are transmitted (parchment, paper, wood, marble, bodies, etc. ), as well as the inscribed object’s visual aspects (illustrations, etc.). Interdisciplinary at its core, this conference examines not only the intersection of literary studies and art history, but also addresses central concerns of the history of science, history of law, aesthetic philosophy, museum conservation, and book history. -Jessica Brantley (Yale), "Forms of Devotional Reading in the Pavement Hours"
-David LaGuardia (Dartmouth), “"Word Matters in the Public Space of 16th-Century Paris"
-Margaret Meserve (Notre Dame), "Publicatio in valvis: the politics of promulgation in papal Rome, 1420-1520"
-Anneliese Pollock Renck (Bucknell University), "'Revitalizing and Resituating an Original': Cicero, Benjamin, and Camille"
This three-day conference investigates how women participated in and contributed to different kinds of community in medieval and early modern Europe. Featuring presentations based on texts and images in traditional manuscript and print format, as well as work that employs new technology and media projects, the conference will be interdisciplinary, and will consider the function and importance of female communities in the natural and social sciences, religion, literature, history, music, and fine arts. Sponsored by MARGOT, a long-term research project devoted to publishing fully searchable editions of texts from the French Middle Ages and the Early Modern period. The Medieval and Renaissance program at Barnard College enables students to acquire a thorough knowledge of the most important aspects of Medieval or Renaissance civilizations and to gain an awareness of the interdependence of historical and cultural developments. All images are drawn from manuscripts/books owned by Barnard College or Columbia University and made available by Columbia's Digital Scriptorium. Images used with permission. The image at the top is from Barnard College's MS1, a fourteenth-century Italian manuscript. The Society for Medieval Feminist Scholarship has announced that the winner of the 2013 prize for the best graduate student article on feminist scholarship on the Middle Ages is Gillian Adler. Gillian, a graduate of Barnard College, is a doctoral student in the English Department of UCLA, working with Christine Chism and Matthew Fisher. Her winning essay, “Female Intercession and the Shaping of Male Heroism in the Roman d’Enéas and Le Chevalier au Lion,” was written for a class taught by Zrinka Stahuljak of the UCLA French Department and will be published in a future issue of Medieval Feminist Forum. Congratulations! Gillian Adler writes: "My paper, 'Female Intercession and the Shaping of Male Heroism in the Roman d’Enéas and Le Chevalier au Lion,' is concerned broadly with how women operate in twelfth-century French romance. I argue that the female intercessory figures who seem to wield verbal power and influence over the shape of these texts are assimilated into a narrative pattern that celebrates redemptive, foundational male heroes. Following the arguments of scholars like E. Jane Burns and Simon Gaunt, my paper looks at how the genre of romance subversively imagines an alternative to the masculinist model of homosociality in the chanson de geste tradition by privileging the place of female subjectivity in narrative, but ultimately constructs instances of female victimization that reinforce fantasies of male genealogical claims and chivalric repute. My interest in the intersection between romance and history developed in my studies at Barnard, when I was working with Professor Christopher Baswell in a course on the medieval imagination of antiquity and with Professor Timea Szell in a course on Boethius and Chaucer’s Canterbury Tales. My undergraduate work with these professors and others on everything from early medieval historiography to late medieval female devotional practices has continued to influence the shape of my current research in the UCLA English doctoral program."